At first blush, the idea of peeling off all my clothes for an afternoon in Wiesbaden’s historic Kaiser-Friedrich-Therme bathhouse hadn’t seemed quite so outrageous. But in the moment, courage was elusive, and the unisex changing room wasn’t helping matters. It looked like this might be more a matter of survival than relaxation. “This is crazy,” I muttered, stretching a wee white spa towel around me on the nippy winter day. On entry, I’d grabbed a handout titled “Bathing like the ancient Romans” describing the two-round, 20-step procedure to fully realize the bath’s potential. A few furtive glances around, and I tiptoed to an empty warming room for a read, hopeful no one would find me. To bathe like an ancient Roman, it turns out, is rather onerous. From warming up to cooling off at precise temperatures, times and humidity levels, a proper spa day would clearly take more concentration than I could muster given my state of undress. Although Wiesbaden is destination-worthy in its own right, my mission on this trip was the German cruise line A-Rosa’s annual Christmas market cruise. This year, it would be on the Rhine River, whose banks are dotted by vineyards and castles. To shake off the fatigue of an overseas flight, though, I first opted for a few days in one of Germany’s famous spa towns. In its early days, Wiesbaden was a coveted Roman post, not for its northern latitude but for its thermal waters that remain a constant 66 degrees Fahrenheit. 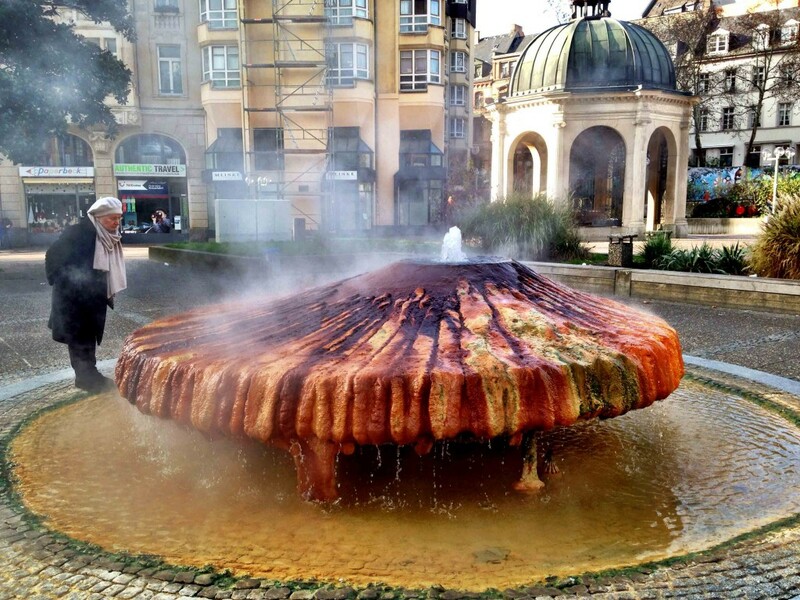 With roughly 2 million liters of the stuff still bubbling out of dozens of springs every day, Wiesbaden has developed a reputation as a health and wellness destination specializing in orthopedic and rheumatoid diseases. Today the city is home to several world-class diagnostic medical facilities, including the Deutsche Klinik für Diagnostik, modeled after the Mayo Clinic in Minnesota. During a walk around the city center I discovered several fountains churning warm, sodium chloride-heavy water from the ground. It’s bewitching even to locals, and some arrive, mug in hand, for their daily drink. Posted signs recommend no more than a liter a day for optimum health. Not the least of modern-day Wiesbaden’s attractions is the pedestrian-friendly town center, an advantage when you’re hoping to bump into gluten-free dining. 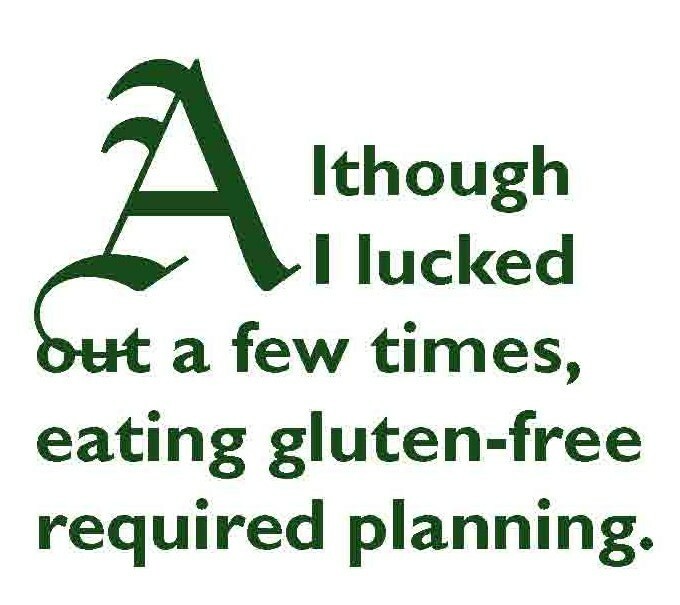 Although I lucked out a few times, eating gluten-free required planning. An obvious choice was the Bohemian-styled vegetarian restaurant Zimt & Koriander, whose regional specialties are rotated every few weeks. I noshed on a papad starter with yogurt peppermint sauce and mango chili chutney, followed by kidney bean and potato curry and a rutabaga with chickpea dish. At I Punkt, a restaurant across from my hotel, the food was classic continental, appropriate in a dining room with walls of paned windows, chandeliers and white tablecloths that give it a museum-like feel. The menu was in German, but with translation by my gluten-enlightened server I was able to have a cod fillet, comfortable that precautions were being handled in the kitchen to avoid cross-contamination. I find fish dishes a good choice when traveling, particularly as my sleep and digestion cycles are interrupted in a different time zone. The relentlessly safe choice of balsamic and vinegar salad dressing is my go-to for salads, one I employed regularly on this trip. My digs for the weekend were the gorgeous 18th century baroque Hotel Nassauer Hof, a hub for international visitors. On the top floor, a mini wellness retreat takes advantage of the thermal spring bubbling below, offering wellness packages that go beyond a massage. Here, the line between medical therapy and relaxation blurs as wellness centers dip into the world of physical therapy, a strategy I’d love to see back home. And while the restaurant with its abundant breakfast buffet and panoramic views is fabulous, the niftiest area is the lobby, which is hopping with international guests reclining, chatting and noshing. 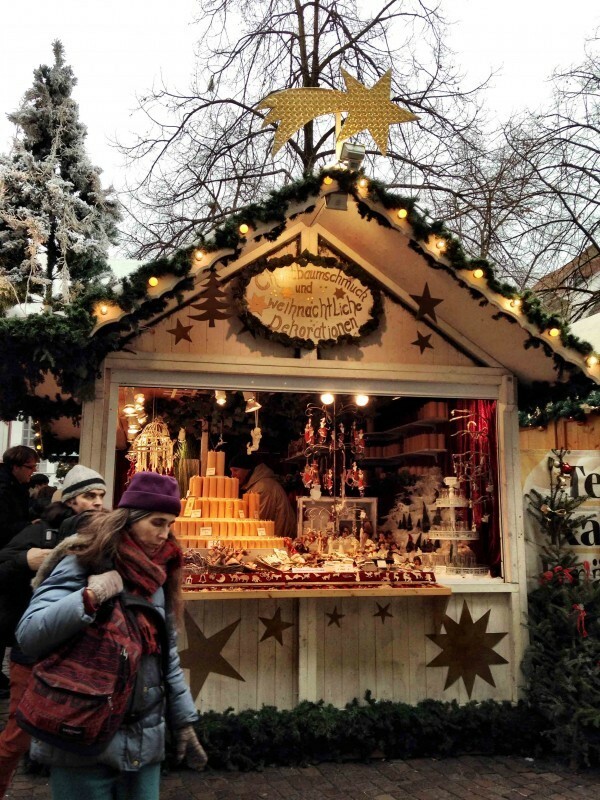 Annual open-air Christmas markets date back to the Middle Ages. They run during the four weeks preceding Christmas and mark the beginning of Advent. Originally held in Europe’s German-speaking regions, over time and with shifting borders the markets can now be found in historic city centers of neighboring Switzerland, Austria and France. The markets aren’t just for tourists. In fact, the number of locals far outweighed that of tourists when I visited—merrymakers arriving en masse to socialize and grab a mug of Glühwein, hot mulled wine with spices. But shopping and eating aren’t the whole story. Choirs, a crèche and storytelling give an old-fashioned feel to the markets, a refreshing change from the over-hyped, consumer-driven holidays we’re accustomed to in the States. Wiesbaden’s market, with its four 33-foot illuminated lilies, was perhaps the prettiest we visited. At 12 years old, Wiesbaden’s Twinkling Star market, Sternschnuppen, is a relative newcomer. In colorful little stalls in the Schlossplatz, or palace square, roughly 130 vendors sell handcrafted gifts, including carved wooden bowls, dipped candles and knitted wool scarves. There was also a small percentage of mass-produced items, which quickly lost their appeal as the trip went on, and we saw them again in other markets. Given the number of markets we visited, though, it wasn’t a surprise to see repeats. Hot, steaming food such as traditional bratwurst and dried, candied fruit was everywhere and very tempting. For travelers with dietary restrictions, however, the markets are minefields requiring careful deliberation. As delicious as some of the food looked, I was generally unable to get a clear explanation of ingredients, relegating me to ubiquitous caramel-covered apples. While I speak passable French and Spanish, German really is Greek to me. Thankfully, there was little cause for worry since getting along in Germany as a non-speaker is relatively easy. And while the country hasn’t quite caught up to its gluten-free friendly Scandinavian neighbors, it shouldn’t be verboten as a travel destination. In fact, enormous strides made by the global gluten-free community to usher the issue into modern culinary thinking are paying off. My personal test remains whether a gluten-free meal is discoverable by happenstance, something that occurred a few times during my trip. To get started after recharging in Wiesbaden, I boarded the 178-passenger Silva, a long, flat, barge-like ship plying the Rhine from Frankfurt to the Christmas markets between Strasbourg and Cologne. Heading south on the Rhine, our first stop was Heidelberg, Germany’s oldest university town. Located in the heart of the Upper Rhine Plain, the area’s claim to fame are mild weather and vineyards. It was raining as we stepped onto the bus that carries excursion-goers past the recently abandoned U.S. Army base into Heidelberg. This is one of the nicer towns, with several shops offering sumptuous gluten-free goodies. Top on the to-see list here is the long defunct Heidelberg Castle, whose perch over the city’s oldest neighborhood, the Altstadt, is one of Germany’s more remarkable views in good weather. It was a short ride down the Heidelberger Bergbahn funicular and off to wander through one of Heidelberg’s six markets. Several of us chose the closest and most obvious in the Alstadt, its narrow cobblestone streets and squares lit like Disneyland on steroids. To my surprise, the shops adjacent to the market were more noteworthy than the market. The little stores were decorated to the nines, and holiday lights exploded along the street as if to warn off the winter cold. Chocolate purveyors, pastry shops and home goods stores tucked stem to stern into the little storefronts that are so common in European towns. Behind the counters, relentlessly happy student offered assistance in perfect English, as window displays fought for visitors’ attention with some of the loveliest little Christmas villages and handmade wooden cuckoo clocks we found. 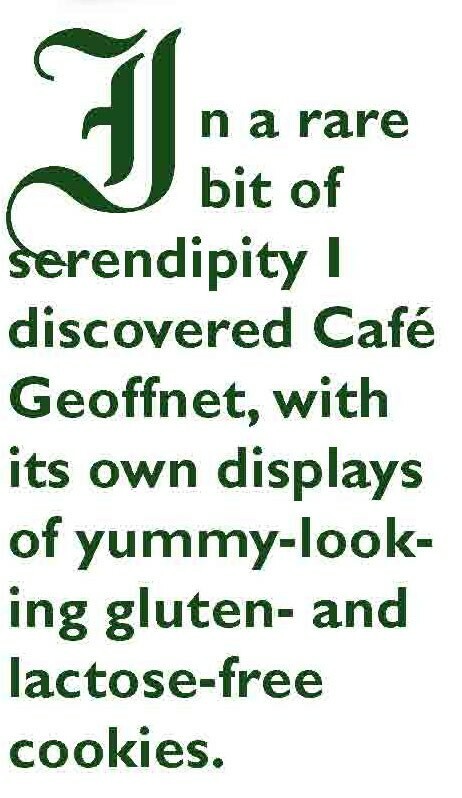 In a rare bit of serendipity I discovered Café Geoffnet, with its own displays of yummy-looking gluten- and lactose-free cookies. Success! Eager to try local food, I snatched up a selection of each, unsure what else I’d find and when. Chocolate hazelnut and almond cookies, crescent-shaped, iced almond and lemon iced cookies and coconut macaroons heaped on large platters were irresistible and delicious. Though cruising Europe’s inland waterways has been popular for decades, Americans are just beginning to have an impact. This trend has not gone unnoticed by cruise companies that, adept at catering to their established European clientele, are now scrambling to satisfy this new demographic that expects more, better and faster of just about everything. This year’s Christmas Market cruise was marketed solely to Americans and was all-inclusive, with most food and drink included in the price. 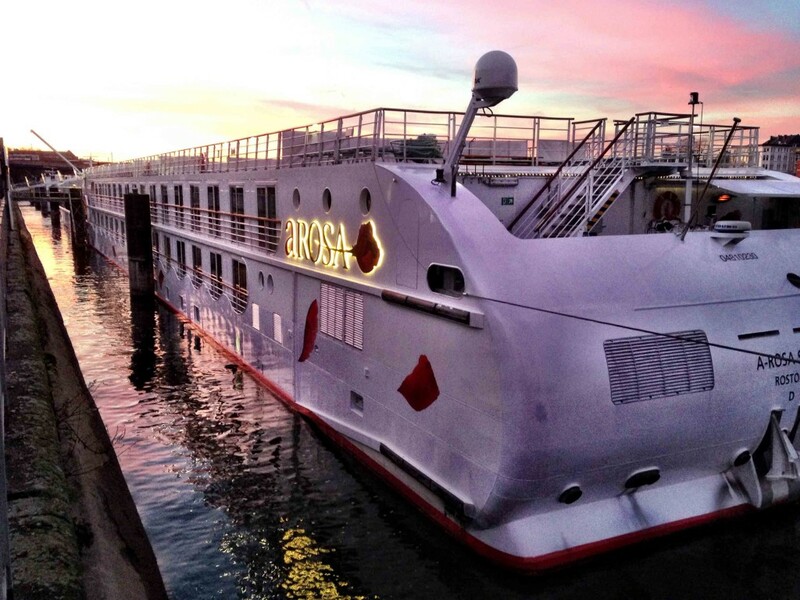 One of the first American-focused cruises for A-Rosa, ours served as a way for the company to sort out American travel habits. I was there to put in my two cents about successfully dealing with the issue of divergent dietary requirements. While there were the occasional mix-ups, the largely Eastern European crew managed beautifully with things they could control. Problems like small cabin size, poor Internet connection while on the river and inclement weather weren’t in that category, though guests endlessly complained about the connectivity. In my experience, Americans are far more vociferous about their needs than Europeans and have become more addicted to their devices. In just a few years, we’ve gone from carrying a single device to carrying multiple ones and expecting 24/7 reception. Cruise food was a mixture of great and terrible. Salads and breakfast were reliable and delicious. I had a long chat with visiting Corporate Chef Andre Jenczewski, who revealed the kitchen appropriately has a separate preparation area for gluten-free meals. Breakfast and lunch were served buffet-style, creating a direct line of communication with the kitchen if I had questions about ingredients in a dish. The maître d hovered around the serving line, and the kitchen staff became quickly adept at identifying gluten-free options for me. Communication issues between the kitchen and guests, however, were most common during the few overly ambitious, multi-course seated dinners. This was not limited to gluten-free diners, either. Some ingredients were too far out for American appetites. When it came to gluten-free meals, confusion sometimes ensued because servers lacked a system to identify guests with dietary restrictions or allergies. Dinners at the buffet on board were a snap, though I always specifically asked which dishes were gluten free. As desserts go, puddings were frequent throughout the trip. I gave the crème Catalan, a peach pudding, a try. A bona fide cheeseaholic, I found the after-dinner cheese tray wasn’t half bad, and when I requested a soft Epoisse with a wink, never expecting they would be able to produce one, I was promptly rewarded. Mainz is one of those cities that you remember long after others have dimmed. It marks the point where the Rhine turns west toward Bingen and Rudesheim, an area renowned for producing the best Riesling in Germany. It’s also roughly where the country divides in half religiously, with the northern part being Protestant and the lower portion Catholic. Mainz, home to a large Catholic population, annually celebrates the “fifth season,” or Carnival, in the Schillerplatz on Nov. 11. It was just a short walk to the market square from our berth, which nicely allowed for mini excursions to the historic market square, known locally as the Liebfrauenplatz. The impressive, six-towered Romanesque Mainz Cathedral and Gutenberg Museum ringing the square are worth every minute you can devote to them. The latter, a multi-story modern building, pays tribute to native son Johannes Gutenberg, the 15th century inventor who revolutionized printing through the development of movable metal type. I opted out of a prolonged museum tour and instead went straight for the top floor’s vault housing three Gutenberg bibles. They were stunning even behind thick layers of glass. I took a quick jog down to the basement, where a replica workshop gives visitors a rare chance to see—and smell—what it was like to mass produce the written word 550 years ago. The 1,000-year-old cathedral required more guidance, and with the ubiquitous headset provided as I departed the ship, I was able to slip in with a group just moving inside. Set in the shadows of the cathedral, the Christmas market here spreads over several streets and winding paths. Around every corner a more enticing stretch of hot bratwurst, chestnuts and handicrafts awaits. More than the others we visited, Mainz’s market had a refreshing emphasis on fresh, made-to-order florals. Wreaths, Advent garlands and center pieces were fashioned with fragrant live greens. If I were a Mainzer, this is where I would shop for my holiday decorations, hands down. By this point I’d gotten into the habit of grabbing a caramel or chocolate-covered apple anticipating I would not find much else to snack on in the markets. 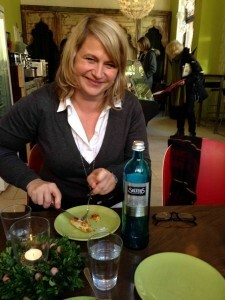 They were among the few places I’ve traveled where I felt having celiac disease was a bummer. Back on board, dinner included a smooth, creamy mushroom risotto alternative to ravioli, crisp veggies and crème brulee for dessert. In haste, my server delivered a gluten-free soup with croutons, which I promptly sent back. This kind of mistake makes me suspicious of what I can’t see, like many others who are gluten free. Located on both sides of the Rhine, Cologne is a vast metropolis and was the farthest northern point on my journey. Perhaps the most obvious choice of excursions is to the Cologne Cathedral, conveniently located next door to the Christmas market. Constructed in the Gothic style and better known as Dom of St. Petrus, the Roman Catholic cathedral has been designated as a World Heritage Site. The market itself was a madhouse and after fighting through the throngs there I wasn’t up for more crowds at the packed cathedral. But then I hit pay dirt. As I was leaving, frustrated by the lack of atmosphere and inability to move, I walked straight toward a stand selling gluten-free apple and cinnamon scones. And just a few feet away I found a stall bathed in steam where fresh, naturally gluten-free organic mushrooms and onions in garlic sauce—bio champignons mit Knoblauch sauce—were being cooked. A full belly can do a lot to improve your perspective. As we were sipping piña coladas in the ship’s lounge, a fellow cruiser used some pretty strong language to criticize the market at Rudesheim. I’m not sure where she got her intel, but the market would, in fact, turn out to be the best one we visited. It was also the last one on the trip, and we arrived in the late afternoon, giving us a chance to experience the revelry like locals. But first we had to get there, which meant cruising down the Rhine in the morning. I was up at dawn, giving me time to sit quietly. I’d begun to feel I’d missed a lot of the river since we did most of our traveling at night. Nestled at the front of the ship in the warmth of the lounge, I watched white, mustard yellow and pale blue houses slip by in the near dark. The occasional tree trimmed with twinkling white lights next to baroque and half-timbered houses was a reminder of the season. Thin spires of town churches and the odd chimney puffing wisps of smoke into the early morning air lent the scene a sort of fairy tale feel. True enough, the main drag of Rudesheim was a bit of a tourist nightmare with its bricks-and-mortar retail stores capitalizing on the Christmas market idea but failing to pull it off with an ounce of charm. But as I turned up a low hill onto a narrow cobblestone alley, I found a hidden gem—the Drosselgasse, originally used as a passageway to the river from homes lying behind the city. Today cheerful little shops and wine gardens are tucked along the way. When I stumbled upon it, there were just enough people lingering to make the scene festive but not overwhelming. Sweater stores, nutcracker stalls and pony rides were unique to the Rudesheim market experience. I felt like I’d been transported back to the Middle Ages, and I wandered for hours, stopping to examine ornaments, toys and even the organ grinder’s monkey before reluctantly heading back to the ship. Winter cruises are an admittedly interesting travel choice, not least because of the weather. Since the ship docked during the day and moved at night, there was little scenery to watch. And gray, rainy days blotted our view of landscape even when we were off the ship, a pity given how lush and verdant the Rhine’s countryside is. But the unique opportunity to experience the build up to the holidays German-style is priceless and one I’ll be reminded of every year. Travel Editor Andrea Kitay is no stranger to winter excursions, having previously written about a snow hotel in Norway for Gluten-Free Living. Learn more about the health and medical experts who who provide you with the cutting-edge resources, tools, news, and more on Gluten-Free Living.